Gayla was named Ms. Senior California. Three individuals and four CIF championship teams were inducted into Oxnard High School's Hall of Fame last week, joining alumni honored last year as the first group of inductees. American flags encircled Plaza Park and red, white and blue bunting festooned the bandstand balcony as more than 200 people gathered on Saturday in Oxnard for a commemorative photo before a centennial celebration of the city’s historic pagoda. The pagoda, designated Ventura County Landmark was built in 1910 to conceal an artesian well and pump that irrigated the park. Designed by architect Alfred Priest, the pagoda was made of concrete and had a tile roof. Far left is Bobby Herrera in red shirt. a “one-in-a-million” find: an 8.7-ounce gold nugget worth an estimated $10,000. has progressed from not being able to do more than hit a few balls at a driving range to playing 18 holes of golf two or three times a week. Friends tell him that he looks so good, they don't believe that he ever had cancer, until he shows them the incision in his skull that looks like a question mark..."So far, he's doing well," said Dr. Liau, noting that the drug is still at least two years from receiving federal approval, and its effectiveness remains a theory, although some patients have survived several years. "It's not proven yet. "So far, so good," he said. 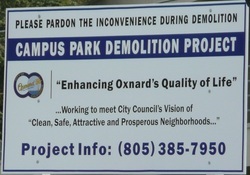 Demolition of several classroom buildings at the old Oxnard High School will begin and continue for the next four months. 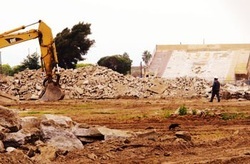 That means the football field, track and bleachers at the site will be out of bounds for safety reasons during the work, said city spokeswoman Christina Aerenlund.The land cleared by the demolition will eventually become part of the future Campus Park, she said. There is no timetable or budget for developing the park.Two buildings and a gym on the 35-acre parcel will continue to be used by the Police Activities League and other nonprofits. The Dallas Cowboys have show interest in using part of the site as their training camp. Solving the mystery of an old friend’s disappearance. Where did my high school go?